This is one of my very favorite blog entries of yours. It touches a place in our hearts for not only ourselves, but memories of when our kids were younger and the new “monsters” they face as adults. 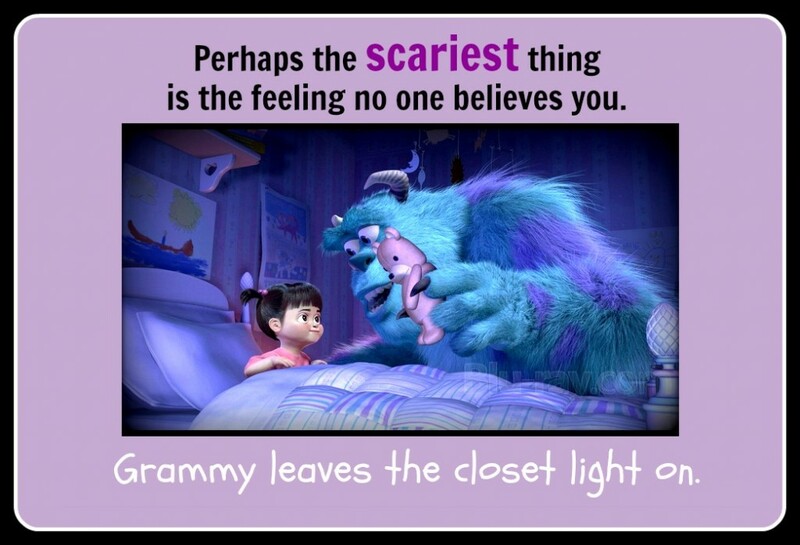 Although I am NOT a grammy yet (I do hope to be one someday.. ) I would definitely scour the room and leave a light on……….Monsters are tricky, you never know when one might pop up. Thank you for being a super hero for the “furrowed brow” people of the world!!! aw, thank you, Kimmer. You may not realize how much you mean to me — and it’s a lot. I am forever grateful you were in my life when I was growing up and play such a big role still. You helped teach me to add a dose of humor to life and you were SO right about it making everything better. I love you 100%. Thank you so much for reading and commenting.